Maruti Ciaz ZDi Plus SHVS is a top end variant in this model lineup, which is now available with an integrated starter generator along with a 1.3-litre diesel motor. This smart hybrid vehicle by Suzuki features a large capacity battery as well as start-stop technology, which aids in returning a healthy mileage. Meanwhile, it carries the same 1248cc diesel mill that is compliant with BS IV emission norms. It has four cylinders and is paired with a 5-speed manual transmission gear box. Coming to its features list, it is bestowed with reverse parking camera, dual front airbags, driver seat belt reminder, ABS and a few other such vital aspects that assure good passenger safety. This sedan's overall look and style remains the same, except for the SHVS badge in its rear end. On the sides, it has an impressive set of alloy wheels, whereas the frontage looks quite appealing with a large, chrome plated radiator grille. In terms of interiors, it has well cushioned seats that offer unmatched comfort, while the storage spaces add to their convenience. Also, the cabin is packed with various sophisticated aspects like automatic air conditioner, touchscreen smartplay system, rear sunshade, accessory sockets as well as power windows that ensure utmost comfort to its occupants. 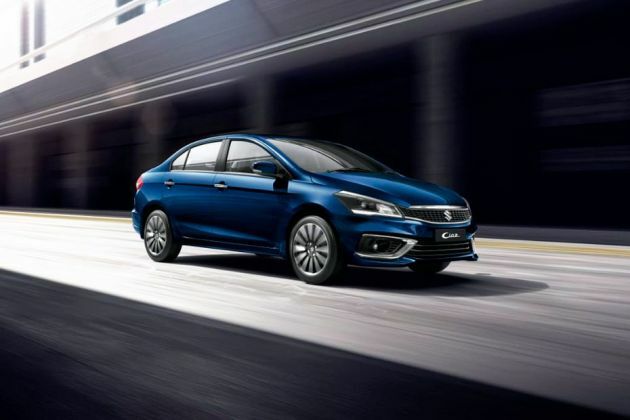 Its striking features and expressive lines are the main elements, which bring an appealing look to this sedan. The trendy headlight cluster at front is integrated with projector headlamps and turn indicators. The bonnet includes visible character lines, whereas the large windshield is equipped with a pair of wipers. The key attraction is the bold radiator grille, which has horizontal slats and plated with chrome. The airdam is pretty wide and surrounded by a couple of bright fog lamps. In its side profile, there are chrome garnished door handles and window sills, and black B-pillars as well. The outside rear view mirrors are in body color and integrated with side turn indicators. Meanwhile, its wheel arches are fitted with a set of 16 inch alloy wheels, which are covered with 195/55 R16 sized tubeless radial tyres. On the other hand, its rear end has combination lamps and a windscreen that includes a defogger. The boot lid is decorated with a chrome strip, and the SHVS badge is also embossed. Besides these, its rear profile also includes a body colored bumper with a pair of reflectors and a license plate as well. This trim has its interiors designed in a splendid way with a two-tone color scheme. This elegant look is further improved by chrome inserts on a few of its aspects. These include AC louvers knob with a chrome finish, door handles, steering wheel and parking brake lever. Its spacious cabin can accommodate around five people with ease. The seats come integrated with headrests and these are covered with fine leather upholstery. It has an illuminated console box, whereas the information display features a trip meter and fuel consumption display as well. Besides these, there are front and rear accessory sockets available using which, mobile phones can be charged whenever necessary. At front, the dual tone dashboard looks quite stylish with air vents, center console and an advanced infotainment system fitted to it. A few other aspects inside the cabin include door trim pockets, rear reading lamps, front center armrest with utility box, sunglass holder, bottle holders and front seat back pockets as well, which adds to their convenience. The car maker has equipped this variant with a 1.3-litre diesel mill that is compliant with Bharat Stage IV emission norms. It has a variable geometry turbocharger that is incorporated with a common rail fuel injection system. Based on a double overhead camshaft valve configuration, it carries 4-cylinders and sixteen valves. Also, this motor is coupled with a five speed manual transmission gear box. It can belt out 88.5bhp peak power at 4000rpm and generates 200Nm torque output at 1750rpm. It can attain a top speed of nearly 155 Kmph and breaks the speed limit of 100 Kmph in approximately 14 to 15 seconds. On the other hand, this trim is also offered with SHVS technology that features an integrated started generator. This hybrid vehicle is fitted with a lithium-ion battery and its fuel economy comes to nearly 28.09 Kmpl. It is offered with a reliable braking system wherein, its front wheels are fitted with ventilated disc brakes and the rear ones are equipped with sturdy drum brakes. This sedan gets a proficient suspension system that helps it in maintaining stability at all times. A McPherson strut is assembled on its front axle and a torsion beam is affixed on the rear one. Besides these, it comes with a power assisted steering wheel that has tilt adjustment function. This not only ensures easy handling but also supports minimum turning radius of 5.4 meters. This top end variant is bestowed with an array of features that assure high level of comfort to its occupants. It has all four power operated windows with auto up/down as well as anti pinch function on driver's side. The rear center armrest includes cup holders, whereas the ORVMs are electrically adjustable and foldable also. It comes with a boot space of 510 litres, which is quite good for storing a lot of luggage. The instrument cluster gives out notifications like headlight on and key off reminder, along with outside temperature display. For the entertainment of its passengers, it has an advanced touchscreen smartplay system that comes with four speakers and two tweeters. This unit supports Bluetooth connectivity, navigation system and it can be operated through switches, which are mounted on its steering wheel. Apart from these, it also includes footwell lamps, engine push start and stop system with intelligent key, electric trunk opening, passenger side vanity mirror, and a few other such aspects. A lot of protective aspects like auto dimming inside rear view mirror, engine immobilizer, reverse parking sensors, anti lock braking system, rear window defogger, seatbelts with pretensioner and force limiters are loaded in this variant. In addition to these, it also has driver and passenger airbags, security alarm, driver seatbelt reminder, reverse parking camera and the Suzuki total effective control technology (S-TECT) based body structure that guarantees enhanced security. 1. Stunning exteriors with many impressive aspects. 2. Safety and comfort features are quite good. 1. Ground clearance can be slightly increased. 2. Rear cabin space needs to be improved further.